This post continues our celebration of the THwomen40 anniversary and looks at the importance of two women in the life of Thomas Preston, a former Master of Trinity Hall. The ante-chapel of Trinity Hall contains two monumental brasses, situated just a few feet apart, of Walter Hewke (Master 1512-1517/18) and Thomas Preston (Master 1585-1598). 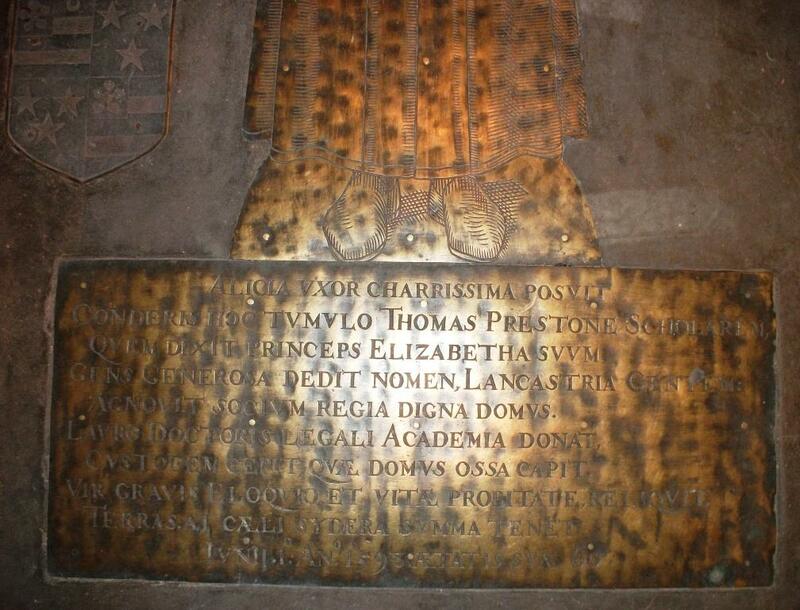 Preston’s brass is particularly interesting for the Latin inscription which contains the names of two women, Alicia and Elizabeth. Who were they and what role did they play in his life? Thomas Preston has the distinction of being the first married Master of Trinity Hall! He was educated at Eton and King’s College Cambridge (1556-81) and it seems likely that he resigned his fellowship at King’s in order to marry Alicia. By this time Heads of Houses, unlike fellows, were allowed to marry but it is not clear whether Preston lived with his wife in College. 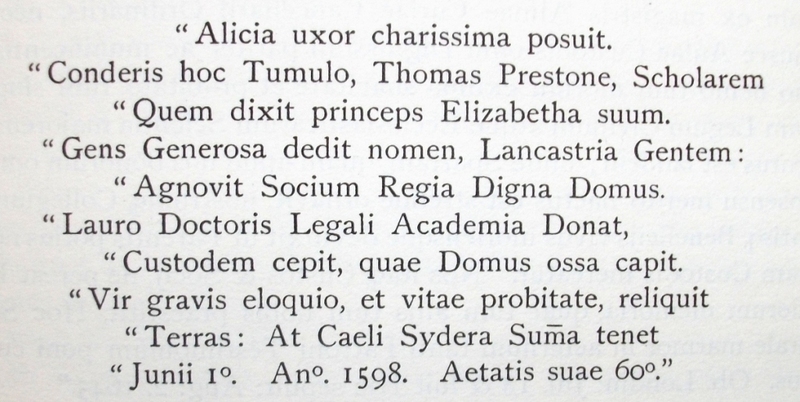 According to Crawley, “The fact that Preston was buried in the ante-chapel does not prove that he resided in College, but his widow at least ensured that she would not be forgotten, for the inscription on his monument begins with her name ALICIA, alone on the first line.” In her inscription Alicia leaves us in no doubt about her importance in Preston’s life! Might Alicia have looked like this ? We know little about Alicia and do not have an image of her. However, we can speculate that as a woman of some standing she might have looked something like the wealthy woman depicted in this brass in a church in Bruges (above). Elizabeth, the other woman mentioned in the inscription, was in fact the Queen of England! Preston first came to the Queen’s attention as young fellow of King’s at the time of her stay in Cambridge in August 1564. This was a gala occasion for both town and gown, with speeches, disputations, religious services, banquets and plays. Preston impressed Elizabeth I with his “gracefull gesture” and “propernesse of person” in his role in the play of “Dido” which was put on for her entertainment at King’s College. He also excelled in a disputation before the Queen on the subject “monarchy is the best form for a state” (and he had the delicate task of speaking against the motion!) and in his oration at her departure from Cambridge. Elizabeth I was so taken with him that she called him “her scholar” and gave him a pension of £20 a year, a substantial sum in those days. And she did not forget him! Many years later in 1585, when the Mastership of Trinity Hall fell vacant, Lord Burghley wrote to the fellows of Trinity Hall staying the election of a new Master. A few days later the fellows were instructed by royal mandate to elect Thomas Preston. The brass, which records that Elizabeth I called him “her scholar”, pays tribute to the importance of the Queen’s patronage in Preston’s fortunes. As Master, Preston set to work to sort out a number of problems including the College’s parlous finances which were burdened with debts “desperate to be remedied”. He was Vice-Chancellor, 1589-90, and was admitted an advocate in the Court of Arches in 1591. Perhaps he is best known today as the author of the play “Cambises King of Persia” which was lampooned by Shakespeare through the words of Falstaff in Henry IV, part I. His name lived on in Trinity Hall’s drama group, the Preston Society. Over time the memory of Preston’s achievements may fade, but the inscription on his brass ensures that the importance of Alicia and Elizabeth in his life is recorded for posterity! This post is an extended version of an article published in Front Court, Issue 21, Spring 2015. For more about the visit of Queen Elizabeth I to Cambridge see the related post Vivat Regina! In the summer of 1564 Elizabeth I made her one and only visit to Cambridge. Marion Colthorpe tells us in her book “Royal Cambridge: royal visitors to Cambridge, Queen Elizabeth I – Queen Elizabeth II” that in honour of the occasion, despite the fact that it was the summer vacation, all the members of the University were recalled to Cambridge. They lined the streets and cheered “Vivat Regina!” as she and her retinue rode into town. The Queen stayed at the Provost’s Lodge of King’s College from 5-10 August, but many of her retinue were put up at other colleges. 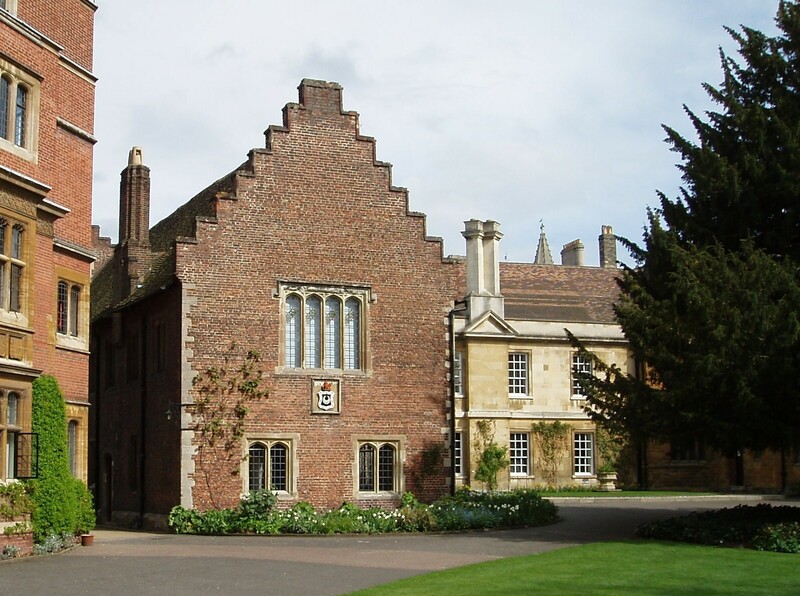 Charles Crawley tells us in his history of Trinity Hall that the Lord Chamberlain and Lord Clinton were lodged at Trinity Hall and that the Queen was welcomed to College with a speech by John Hammond (fellow 1557-74). The University and town organised a full programme of events, including orations, debates, services and, best of all, plays which were put on most evenings for her entertainment. On Sunday 6 August, after Evensong, Elizabeth saw Plautus’s “Aulularia” which was performed in Latin on a ‘great stage’ built in King’s ante-chapel. The players were drawn from all the Cambridge colleges, with the exception of King’s. The reason for this was that men from King’s were busy preparing for performances due to take place on the two following evenings. On Monday evening they formed the cast of “Dido” written in Latin by Edward Halliwell and on the subsequent evening, Tuesday 8 August, they performed Mr Udall’s “Ezechias”. A certain King’s fellow (who subsequently became Master of Trinity Hall) caught the eye of the Sovereign in the play of “Dido”. She was very favourably impressed by Thomas Preston (for that was his name), “putting forth her hand for him to kiss, her Highness … dubbed him ‘her scholar’ … and therewithal she gave him eight angels”. An angel was a gold coin worth 10 shillings and in addition the Queen promised Preston a handsome pension of £20 a year! It was Thomas Preston who made the final oration, again in Latin, on the occasion of the Queen’s departure on 10 August. All in all the visit has been a resounding success and his meeting with the Queen was an episode that Preston was never to forget. His brass in the ante-chapel of Trinity Hall bears a Latin inscription recalling the day when Elizabeth I called him “her scholar”. Preston’s brass in the ante-chapel (usually covered by a Persian carpet) – and a view of Preston’s feet! The meeting was also to have repercussions for College. Twenty one years later, just before the death of Henry Harvey (Master 1559-1585) a royal mandate was sent to Trinity Hall staying the election of a new Master. This was followed by another royal mandate directing the fellows to elect Thomas Preston. Elizabeth I and Burghley had chosen “her scholar” for the job! Preston was Master of Trinity Hall from 1585 until his death in 1598, and he also served as Vice Chancellor of the University from 1589-90. According to Crawley, Preston wrote to Burghley that Trinity Hall was labouring under a “store of abuses” and that its debts were “desperate to be remedied”. Nonetheless, it was during his tenure that College undertook the expense of building a new library, the “Old Library” as we know it today. It is fitting that the Old Library houses two precious documents from Queen Elizabeth I. 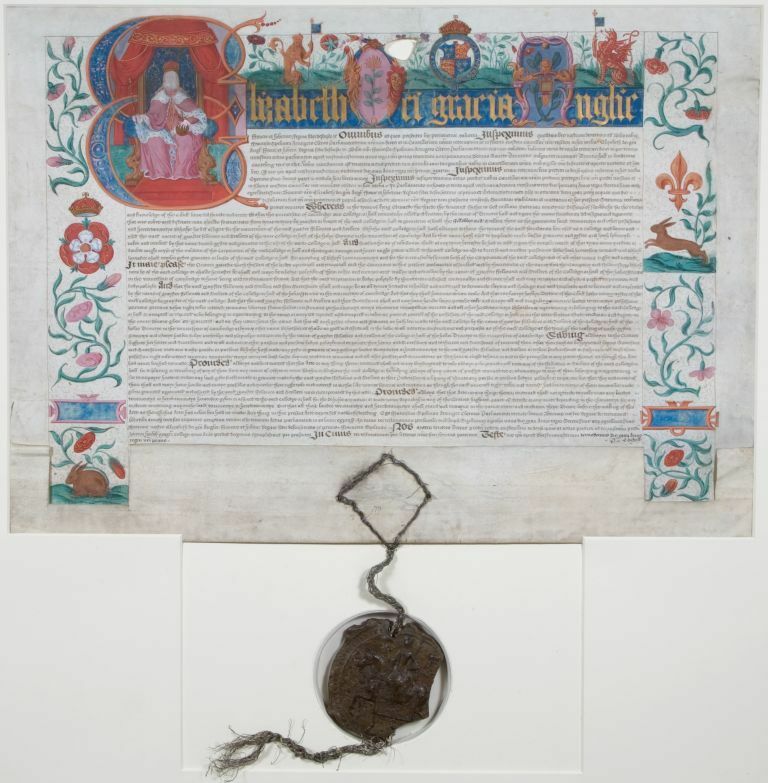 The first document is the charter reconfirming the original foundation of Trinity Hall in 1350 which was granted to College in 1559, the first year of Elizabeth’s reign. It represents the return of academic life to something approaching normality after the upheavals of the Reformation and the reign of Queen Mary, when Colleges had been closed and amalgamated and new Colleges founded. Queen Elizabeth can be seen enthroned in the large capital “E”. The impressive signature of the most powerful woman in the land! The second document is a letter to the College, dated 2nd September 1587, requesting the leasing of two manors to one of Elizabeth’s courtiers, Ralph Bowes, Master of the Queen’s Games. The letter bears the impressive signature of Queen Elizabeth I. On the reverse, it is addressed to the Queen’s “trustie and welbeloved the MS [Master] and fellowes of Trinitie Hall in Cambridge”. Of course, the Master at that time was the Queen’s “scholar” Thomas Preston. Thomas Preston was well-known to contemporaries as the author of the play “Cambyses King of Persia”, which was registered by the Stationer’s Company in September/October 1569. Shakespeare poked fun at the play’s bombast through the mouth of Falstaff, who says “Give me a cup of sack to make mine eyes look red, that it may be thought I have wept; for I must speak in passion, and I will do it in King Cambyse’s vein.” (Henry IV Part I, Act II, Scene 4). Today his name lives on in Trinity Hall’s drama society, the Preston Society, which puts on College musicals, pantos and plays. But undoubtedly Thomas Preston’s outstanding legacy is that his Mastership presided over the building of the “jewel in the crown” of Trinity Hall – a wonderful Elizabethan library, still virtually unchanged today. Most of the information about Elizabeth I’s visit to Cambridge in 1564 is taken from Marion Colthorpe’s “Royal Cambridge: royal visitors to Cambridge, Queen Elizabeth I – Queen Elizabeth II”, Cambridge, 1977. For more detail about the 1564 royal visit see Marion Colthorpe’s “Elizabethan court day by day” on Folgerpedia. Trinity Hall: the history of a Cambridge college, 1350-1975 / Charles Crawley. Cambridge, 1976. Warren’s book / edited by A.W.W. Dale. Cambridge, 1911.